Sokkia proudly presents the POWERLEVEL SDL30, a digital level with a large internal memory. All you have to do to measure height and distance is aim the unique RAB-Code staff, adjust the focus and press a single key. The results are immediately indicated digitally on the LCD display and can be recorded in the internal memory – making the SDL30 the ideal instrument for quick and easy leveling. “How can we make leveling work quicker and easier?” was the question foremost in the minds of the SDL30 designers. 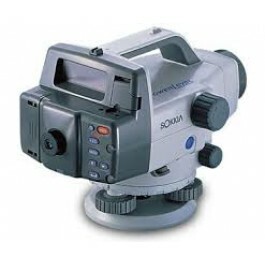 Sokkia boldly eliminated complex functions that complicate operation, resulting in an extremely simple and efficient digital level designed primarily for height and distance measurement – the essential role of the “Level”. Measurements are made within three seconds with a single touch of a key, and can be stored immediately in the internal memory.